We are pleased to introduce the second Archives.com grant recipient for January 2011. 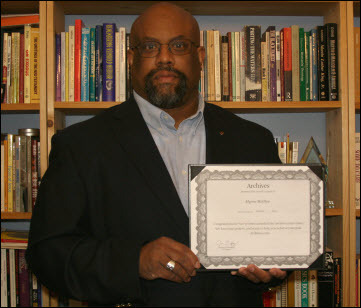 Myron is an avid family historian, who will take his research to new heights with the Archives.com grant award. Background: Myron McGhee is a librarian by profession based in Atlanta, Georgia. His personal research seeks to explore the possible relationship between his African American ancestors and a neighboring white family of the same name. This investigation builds on the considerable research of his father, who began researching the family's ancestry in 1969. He notes, "I know about my family's history due specifically to his efforts. For more than four decades he documented as much of my family's history as possible using legal pad and pencil. Many family vacations were spent driving from our homes then in Ft. Hood, Texas and later North Carolina to Alabama so that he could visit archives or track down relatives to interview." Myron has already received national recognition for his research. In 2009 he won the National Archives and Records Administration (NARA) competition for students demonstrating the use of state and national archive materials. About the project: Myron wants to further research by traveling to Alabama to interview residents, review deed transcriptions, and scan photographs - as existing digitized materials in this area are scarce. Myron seeks to engage in face to face conversations with local historians and the few surviving relatives who may have key information about his ancestors. Several of these relatives continue to reside on land purchased by family members in the 1890's. Ultimately, Myron's goal is to publish the results of his work exploring the historical connection between enslaved relatives and the potential slave owners. Of his quest he mentions, "My hypothesis is grounded on the belief of a connection between two families far more than by name. In ways yet unknown, I hope that exploration of relationship between two extended families offers hope for the future and alters the manner in which typically polarized communities might engage one another. I would hope also that my work provides some instruction by example for the genealogical research of African American families." Archives is happy to help Myron complete this important research. We wish him the best of luck in his genealogical pursuits, and look forward to seeing the outcome of his work!